Co. Limerick: Abbeyfeale (2), Ardagh, Ballingarry (3), Castletown (2), Clonneagh, Drumcallagher, Killagholehane, Killeady (2), Kilmeedy, Mahoonagh (2), Monagay (2), Newcastle (3), Rathronan. The Board also included 7 ex-officio Guardians, making a total of 29. The Guardians met each week at 10am on Thursday. The population falling within the Union at the 1831 census had been 51,650 with divisions ranging in size from Killagholehane (population 1,673) to Ballingarry (8,651). 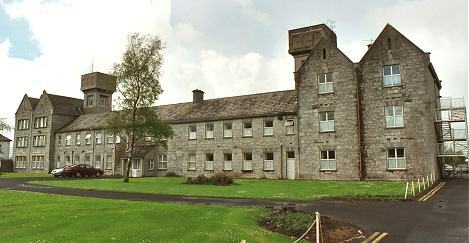 The new Newcastle Union workhouse was erected in 1839-40 on a five-acre site at the north of Newcastle West. Designed by the Poor Law Commissioners' architect George Wilkinson, the buildings were planned to accommodate 550 inmates. Its construction cost £6,680 plus £920 for fittings etc. The workhouse was declared fit for the reception of paupers on 18th February 1841, and received its first admissions on 15th March. Newcastle aerial view from the south-east. An entrance and administrative block at the north of the site contained a porter's room and waiting room at the centre with the Guardians' board room on the first floor above. During the famine in the mid-1840s, houses were hired and alterations made at the workhouse to accommodate an additional 360 inmates. 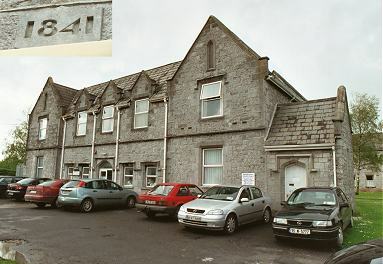 A new block, possibly built as a fever hospital, was subsequently erected at the north-west of the workhouse. A local directory of 1902 reckoned that the workhouse could accommodate 1,270 inmates. In 1852, the eastern part of the union went to form part of the new Croom Poor Law Union. From 1892, nursing care at the workhouse was provided by nuns from the order of the Sisters of Mercy. 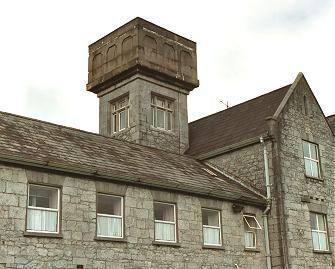 The former workhouse later became St Ita's Hospital and continues to provide care for the elderly.